MetalForming and Fabricating Product News magazines, publications of the Precision Metalforming Association, proudly announce the launch of a new website dedicated to all things related to enterprise-resource-planning (ERP) software. Whether you’re looking for new software or for advice on how to improve use of your current software, the website, www.manufacturingerp.org, will provide solutions. Tune in to www.manufacturingerp.org for articles, industry news, guest blogs, thought-leadership white papers, video presentations, archived e-newsletters, conference PowerPoint slide decks and more. Are you a manufacturer that is currently doing business in Mexico or would like to expand your business into Mexico? 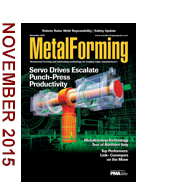 Join MetalForming Mexico magazine and the Precision Metalforming Association (PMA) at the Mexico Executive Forum and Technical Conference, February 2-4, 2016, in Monterrey, Mexico. This year’s program will feature an executive roundtable as well as two full days of technology presentations – an ERP software experience and a press and die maintenance seminar. Visit the event website for a complete agenda, a list of speakers and registration. July and September of 2015 are months better forgotten for manufacturing, as both witnessed record-high manufacturing trade deficits. An article from Trumpet.com quotes a handful of economists, each of which portrays a slightly different take on the U.S. economy in general, and U.S. manufacturing specifically. Says one economist: “The closer I look at the data, the more contradictory it looks.” Another argues that America’s manufacturing decline is overstated, since overall industrial production is still increasing. The September manufacturing trade deficit was the largest in history, and the second largest was recorded only two months prior in July. Check out the secret behind the body structure of the all-new Kia Optima, which uses more than 51 percent advanced high-strength steel (AHSS). That represents a 150-percent increase over the previous model. The vehicle is one of 10 finalists for 2016 North American Car of the Year, as voted on by the Automotive Press Association. As noted in this 1-min. YouTube video, manufacturing the new car body employs hot stamping of components in 16 core stress areas—a 350-percent increase over the previous model. Included in the video are crash tests comparing structure performance with traditional steel grades, AHSS grades and hot-stamped steels. Results are impressive. This overview of current capabilities and maintenance tips can help accomplish just that. > Italian Metal-Fabricating Trade Mission: Fantastico! Fantastico is one word that best describes a week-long tour of Northern Italy and visit to several machine-tool manufacturers and their customers. Read on for a look at new developments in forming and cutting technology, and how fabricators turn technology into revenue and profits. Sheet Metal Punch Operator (IA) / Geater Machining & Manufacturing, Co.
See also: ETA Dynaform, ABC Metals, Inc.